One of my all-time favourite photos comes from a book of cakes. But it’s not just any old food photograph. This is a picture of my big brother as a toddler – all beaming smiles and golden curls – sitting in front of a giant drum-shaped birthday cake, two batons clutched in his hands. The photo was taken for a book written by one of my mum’s friends, Cakes for Kids, and provides the perfect snapshot of what baking and birthday cakes are – in my mind – all about; the pleasure of creating something to share with others, something that will bring joy long after plates are licked clean and memories are all that remain. The look of glee on my brother’s face says it all. This is a sentiment shared by Fiona Cairns, a fabulous baker in her own right, more recently catapulted to household name status by her role in a certain Royal Wedding. A couple of weeks ago, the lovely people at Quadrille asked if I’d like to review her new book of cakes. I’m never quite sure what I think about bloggers accepting freebies, but when it comes to recipe books, in particular those involving cakes and baking, I find it pretty hard to say no. Luckily The Birthday Cake Book is a winner; from the fabulous photos and gorgeous recipes through to Fiona’s own ethos, inviting readers to ‘stir love’ into their cakes, it’s a wonderful addition to any baker’s bookshelf. When writing my review (which you can read on the Quadrille Books Blog), it felt only right to try making a few recipes from the book. I suppose I could have just reviewed the content, but I wanted to know if these wonderful sounding recipes and elaborate decorations were actually feasible for the home baker. The proof would be, quite literally, in the pudding. Being slightly prone to tinkering with recipes, I decided to combine elements from a couple of different cakes to come up with my own creation. This is something Fiona encourages in the book, and means it has a longer shelf life for the adventurous baker – the combinations within its pages are pretty much endless. I opted for Devil’s Cardamom-Chocolate cake as my base. Made with ground almonds, whisked egg whites and very little flour, this is a moist, crumbly cake brought to life with a spicy kick of cardamom. In the book it appears as a Swarovski-studded crystal skull – not quite what I fancied for a low-key dinner party – so I opted for pretty rose-piped buttercream swirls, copied from a second recipe. Rose in shape that is, not flavour, but after reaching for my copy of Niki Segnit’s Flavour Thesaurus to find a suitable partner for the cardamom cake, I realised that the floral scent of rose would, in fact, be perfect. Throw in a little white chocolate and you’ve got a match made in sweet, spicy heaven. I’ve provided quantities for each element in the recipe below, but this is very much one to taste as you go. A little too much cardamom in the cake and you’ll be tasting the eucalyptus notes of Vicks VapoRub rather than enhancing the chocolate with warm, woody undertones (as discovered by an unfortunate candidate on the Great British Bake Off just last week); a little too much rose water and your icing could move from a slightly sickly-sweet but oh-so-delicate touch to the overpowering embrace of an over-scented elderly aunt. 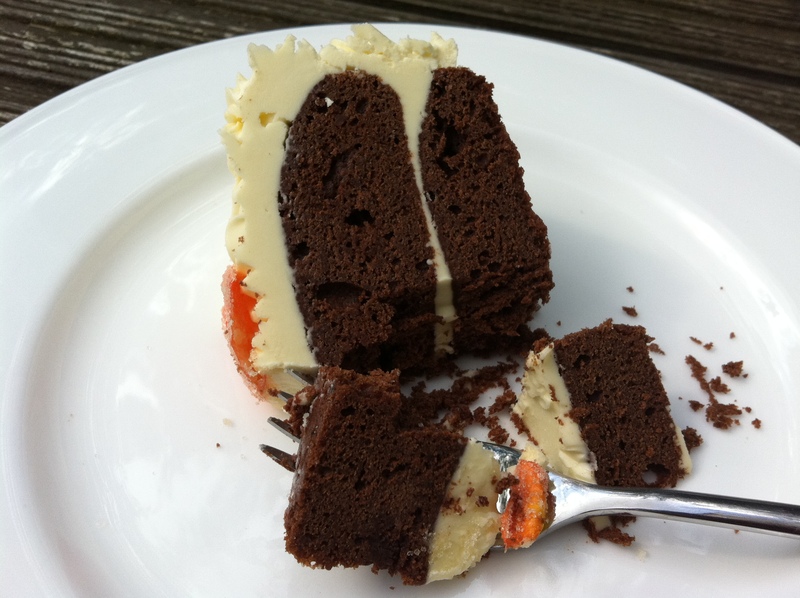 But get it just right, and the cake is an exotic harmony of beautiful, surprising flavours. The quantities below sound like they make lot of icing. Ok, they do make a lot of icing. But I promise you that for every person who scrapes the excess to one side and declares it too sweet, another will swoop in and polish off their leftovers. If you’ve ever bought a cake from The Hummingbird Bakery, you’ll know what I mean. Grease and line two 20cm round tins. Preheat the oven to 170 degrees C.
Sift together the cardamom, flour and baking powder into a large bowl, then stir in the ground almonds. Set a large bowl over a saucepan of barely simmering water, and melt together the chocolate, butter and 1 tbsp of water. Once melted, remove from the heat and beat in the sugar. Beat the egg yolks into the mixture, one at a time, then add the brandy. Fold in the flour mixture and mix lightly together. In a large clean bowl, whisk the egg whites with the salt until soft peaks form. Fold one big spoonful into the chocolate mixture to loosen, then gently fold in the rest. Divide the mixture between your two prepared tins and bake for 15-20 mins, or until they spring back to the touch. Remove from the oven and cool on a wire rack. Whip the butter in a blender until light and creamy. Add the icing sugar and vanilla extract, followed by the cooled chocolate, then blend until fully incorporated. Add the rose water a little at a time, blending and tasting to make sure you get the perfect balance of floral scent and creaminess. Gently pull the leaves from the rose, discarding any that are brown or discoloured. Put the egg white in one bowl and the sugar in another. 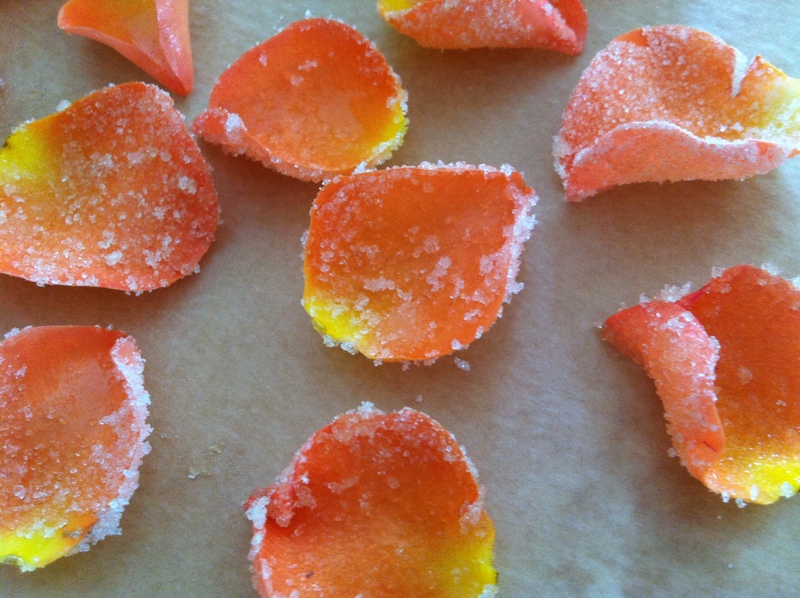 Using a pastry brush, gently brush each petal with the liquid, then dip into the sugar. Leave on a plate lined with baking parchment for an hour to harden. Slather a little buttercream on a cake board or plate. Position one cake on top, spread with a layer of buttercream, then put the second cake on top, good side up. Spoon the remaining buttercream into a large piping bag fitted with a medium star-shaped nozzle. Pipe roses over the top and sides, starting from the middle and working out to fill in the gaps. If you’ve ever iced a cupcake, it’s pretty much the same principle, and pretty simple for how beautiful it ends up looking. Arrange the crystallized rose petals on top and store in an airtight container until ready to serve. This cake looks really beautiful, the swirled buttercream is so sophisticated! I had a cardamon hot chocolate afew months ago really liked the combination. This looks like a great recipe to work the two ingredients together. mmm cardamon and rose. total winner. think cake looks pretty darn amazing! 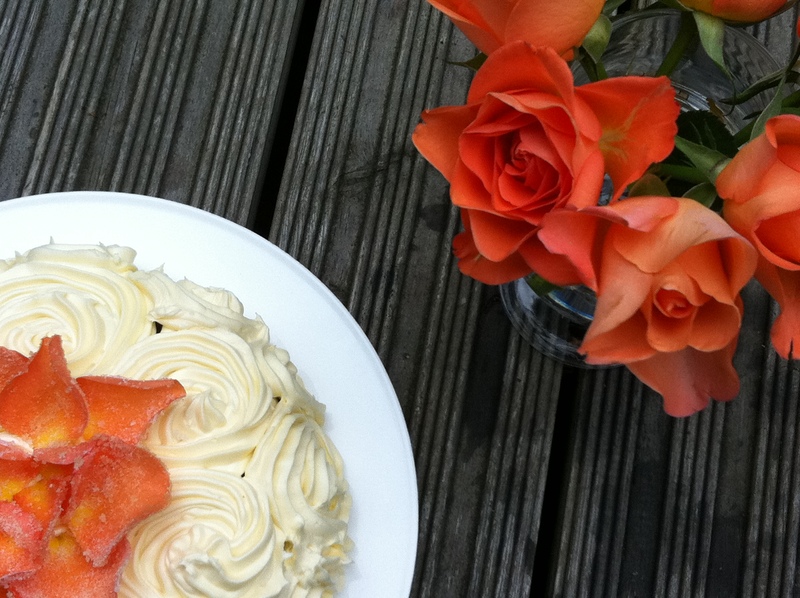 Just beautiful – what a gorgeous cake. I wish I could pipe anything half as pretty! I’ve never thought to put cardamom and chocolate together. My standby cake is a coffee and cardamom sponge which I now intend doing the roses with to make it my three favourite flavours together. I also can’t wait to try making this one though. Looks so rich and decadent! That is just absolutely beautiful! 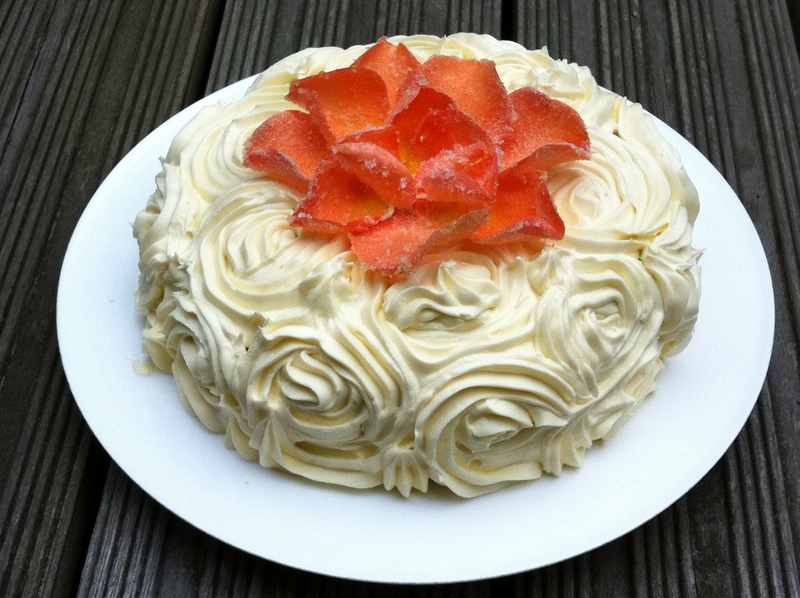 I love the way the white icing swirls into roses. What a beautiful cake! So so elegant. Thanks everyone who has commented for your lovely feedback 🙂 I really recommend giving these roses a go – they are so much easier than they look! i made a cake with such piping as well before. your’s looks great, littleloaf! I just love cardamom but never paired it with rose. Must give it a try! I am dying to make this cake for my best friend’s birthday. She is from India, loves chocolate, and I feel like this marries sweetness and spice perfectly. Only trouble is, I am in the US and am having a hard time figuring out the recipe measurement conversions. What is the best way for me to go about figuring this out? Thanks!! Hi Carmen – so glad you like the cake! I have exactly the same problem converting cups into grams so completely understand. The best converter I’ve found is this http://www.pastryscoop.com/category/look-it-up/conversions/ – hope that helps and would love to see a photo if you end up making the cake! I love cardamom and chocolate together! I make cookies with that combination and they are exquisite, I must say. I cant wait to try your cake!